Easy to Make Custom Liquid Foundations! Essential Wholesale & Labs’ liquid foundations are truly unique. We have one-of-a-kind liquid makeup that is not only high in antioxidants Rosemary Extract but is also packed with nourishing ingredients for the skin. Soothing organic Aloe Juice, skin conditioning cold pressed Carrot Seed Oil, balancing Golden Jojoba, firming DMAE, smoothing and softening MSM and moisturizing Meadow Foam Seed Oil make our liquid foundations a rich source of vital nutrients for optimal skin health and beauty! You can use these wonderful lightweight silky mineral powder foundations as a concealer (simply use wet), foundation, or you simply use the mineral powder instead of the liquid foundation. To use the powder, dip your brush into the powder and tap the side of the jar to remove excess powder from your brush before application. To use the powder as a spot concealer, wet the tip of a small makeup brush and dip ever so slightly into a very small portion of powder and apply to face. As a powder foundation, for a light to medium coverage, apply to face with a soft and fluffy powder brush. After cleansing, toning and moisturizing, work the powdered foundation across your face. Use a foundation brush to blend around your hairline and jawline. Setting Spritz can be used to set your makeup and give you a finished, smooth look. This fabulous Spritz is also convenient for refreshing and hydrating your skin at any time. Setting Spritz can boost your skin’s radiance, as well as minimize the appearance of age spots, sun spots, and fine lines. Fabulous for all skin types, including oily, sensitive, normal and combination skin. Finally, Setting Powder extends the life of your carefully applied makeup throughout the day and helps prevent smudging. If you want full coverage that is long lasting and doesn’t “slide” off your face before the end of the day, this setting powder is for you. When used with powder or liquid foundation, it enhances the smoothness and silkiness to your skin. Essential Wholesale & Labs uses Mica and Aloe Vera to create an extremely light and silky setting powder, which is oil free. Essential Wholesale & Labs’ Setting Powder will aid in oil absorption and give your face a smooth, flawless, matte finish, along with environmental protection. It can even be used as a face powder for very light coverage. How-to-use: After applying your foundation, apply a small amount of Setting Powder to your brush and spread evenly over your entire face in outward motions making sure to blend. Can also be used alone. 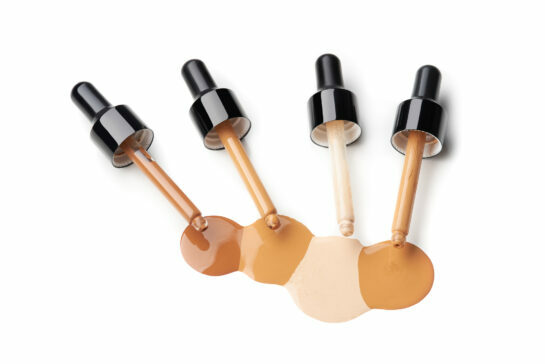 Create your own custom color by purchasing a Powder Foundation and Colorless Liquid Foundation. Follow this simple recipe below or create your own custom color! This recipe is THE recipe we use to make all the liquid foundations we sell! Please note that this recipe has not been challenge tested for preservation efficacy. If you use this recipe for market sales, it is up to you to ensure the safety of the product.